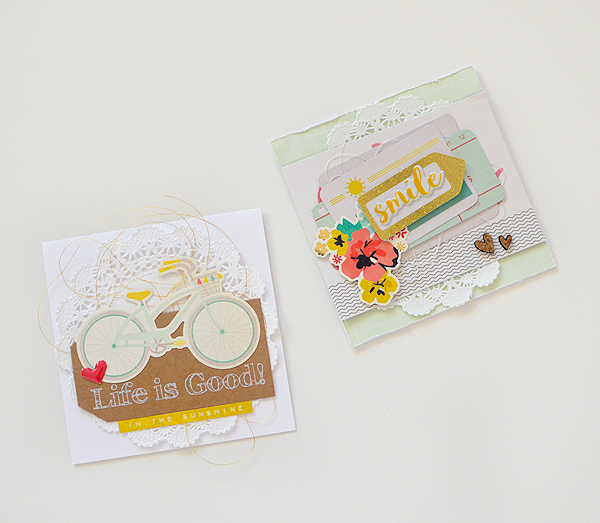 I'm getting back to my paper crafting roots today with a handful of cards that I made from the Gossamer Blue August kits. 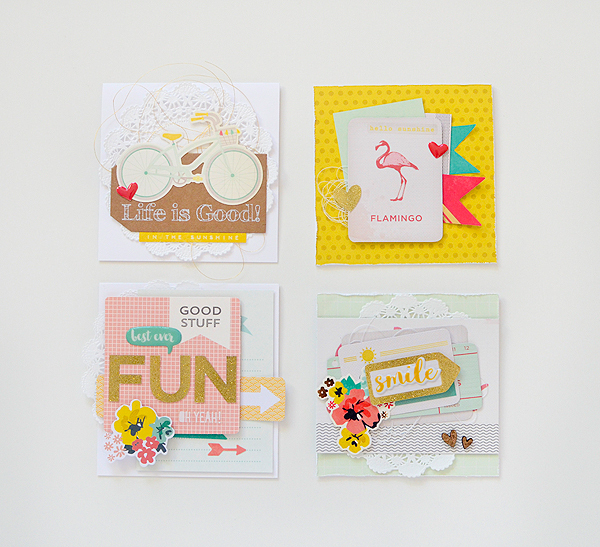 Have you checked out the kits yet, or subscribed? There are a few that have already sold out so you'd better hurry! 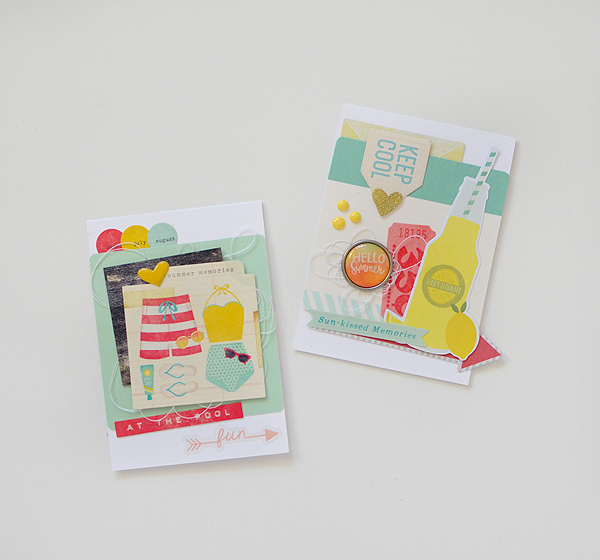 I'll admit that sometimes, when I'm crafting, I start putting different elements together and I don't always know what I'm going to end up making--a card, a tag, a package, something else? In many ways, if I sit down and tell myself to make a card, the process takes longer because I've given myself the limitation of only making a card. But if I sit down to craft and I'm just gathering bits and pieces to make something--anything--the compositions seem to come together much faster. When I was creating my GB projects for August, I was working on all of them at the same time. That's generally how it goes each month when I break out my kits. I love the freedom I have to make whatever my heart desires, and in August, for example, I ended up with quite a few projects; I even have a couple unfinished pieces. I can't promise they'll ever be completed, mind you, but they still sit just 2 feet away from me...hoping. 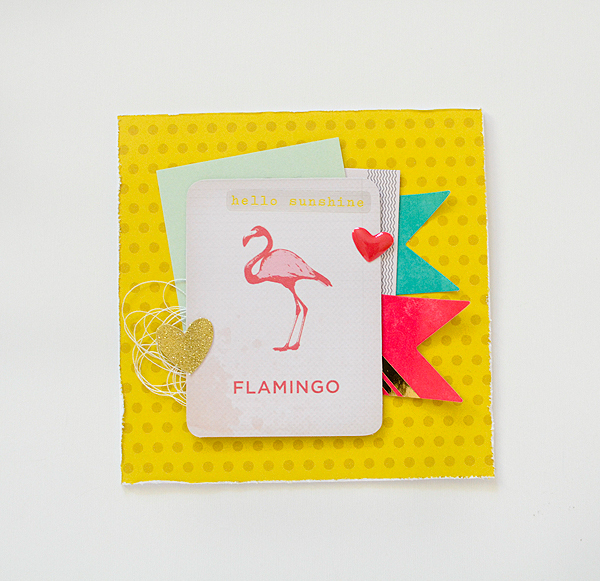 This yellow card with the flamingo was actually going to be something else...a 4x4 enclosure card (which you'll be seeing many more of later this month! ), but no matter what I did, I could not get a finished product that I loved. But when I tried a rearrangement and piled everything on top of a 4x4 folded card instead, I liked the results much better. And here, I was desperately trying to get this to be a tag. 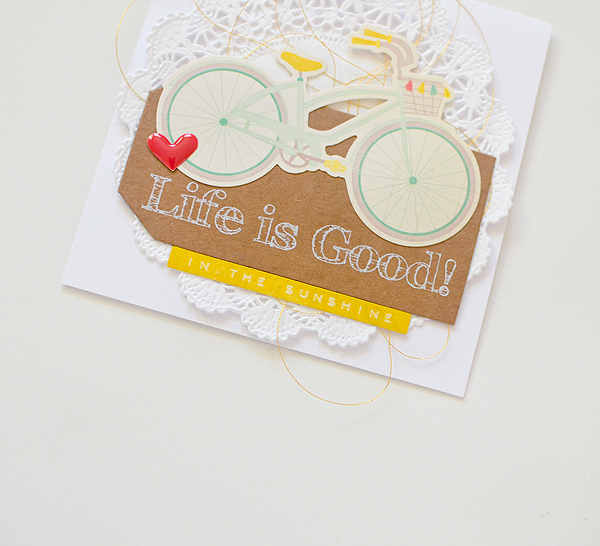 The 'Life is Good' tag is already a tag, for one, and I liked the simplicity of the bike sticker with it. The problem? Since the bike is a sticker, I'd need to tediously trim some white paper to put behind the part that is not adhered to the tag or it's going to stick to everything it comes into contact with. My other option was to add a patterned paper or another kind of backing, again, so the sticker had something to rest against. I wasn't crazy about either of those choices. 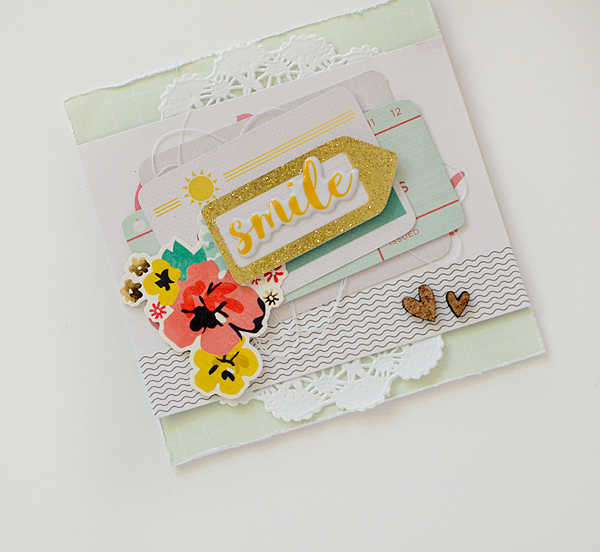 So I grabbed another 4x4 folded card, added a doily and some gold thread, and I liked what I saw. 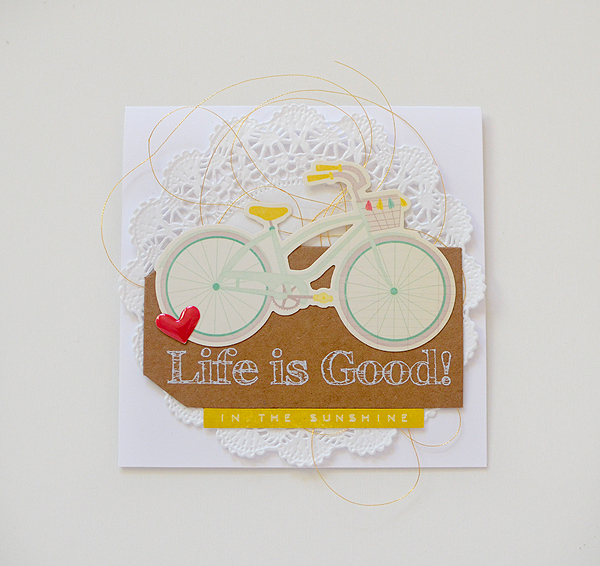 The finishing touch was the 'in the sunshine' sticker underneath the tag; it balances the yellow from the bicycle's handlebars and seat. That may not have been possible to add if this was a tag. This 'free' experience doesn't come without it's little problems, though. When you're sitting down to create and you have no limitations (or limited limitations! 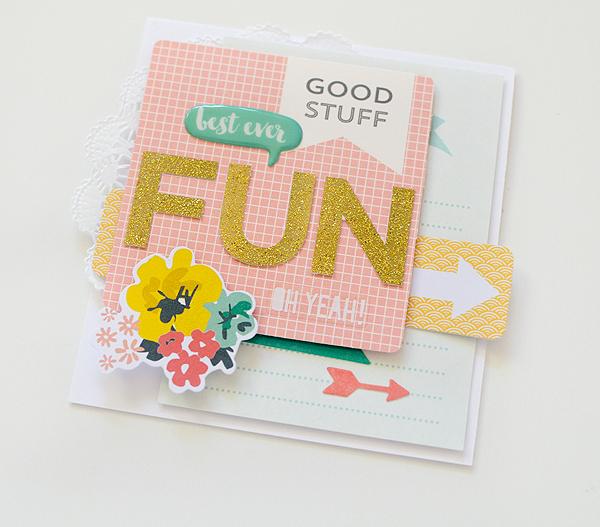 ), staring at a huge pile of new papers and embellishments can be overwhelming without having some kind of direction. In those situations, I generally find my groove after awhile and the projects begin coming together. With these kits, in particular, I made a lot of stuff! 6 cards, 12 enclosure cards, 3 large tags, and a jar of 20+ mini tags (also, more on that later this month!). That's what happened when I allowed myself to create without limitations. I didn't start out by saying I would make this, this, or that. I just started creating and up until the very last minute, I didn't actually know what my angle was! I usually do try to have sets of things (cards, tags, gifts) because a set tells a better story than random pieces thrown together...ahem, like I've got here today ;) BUT, when you make a coordinating set, you give yourself restrictions and my point today is about not setting boundaries and just being free to color outside the lines. 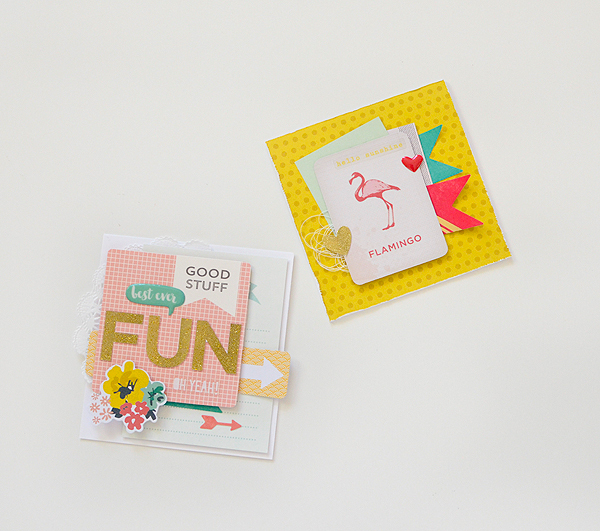 Because sometimes, you just have to go where the day takes you, even if it's a bundle of mismatched greeting cards. These are all so wonderful! 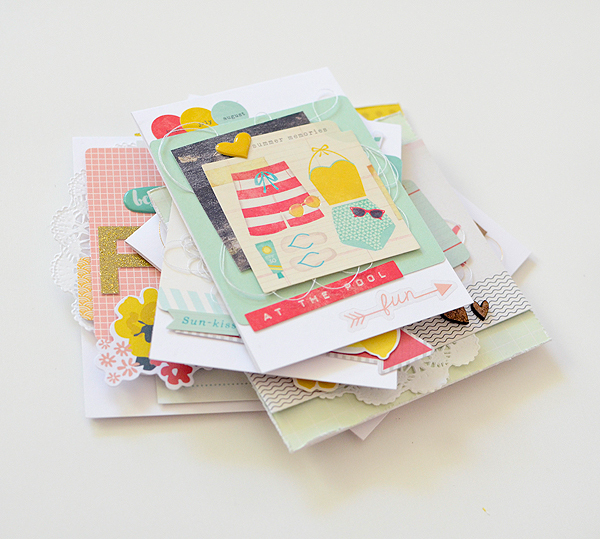 Gorgeous stack of cards!